There are a few tricks to getting RealPlayer to work right under x86_64 Linux. 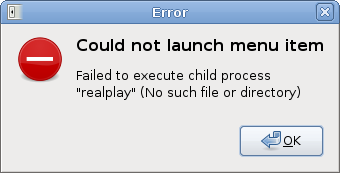 Realplayer is a 32-bit application and needs a bit of coercing to run smoothly. First, get the installer from Real’s site. Download the normal installer, named something like RealPlayer11GOLD.bin, instead of the RPM version. To use the installer and RealPlayer, you’ll need to get 32-bit versions of some common libraries. The installation is self-explanatory. I installed to ~/software/RealPlayer. The installer adds a link in the GNOME Sound & Video menu. It doesn’t work though. The GNOME menu doesn’t expand ~, so you need to enter the full path to the script. Now, the menu item should work. The next thing you might notice is that while RealPlayer works, it looks awful. 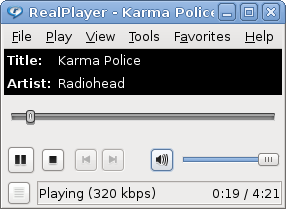 Basically, if the /etc/debian_chroot file exists, it runs RealPlayer directly. 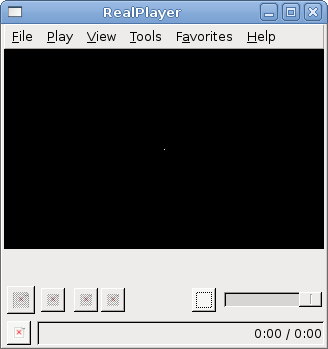 Otherwise, it runs RealPlayer using schroot. I don’t think standard chroot creates the /etc/debian_chroot file, but schroot does. The reason the script doesn’t always run RealPlayer using schroot is that applications that are already in a chroot, like firefox, may need to run RealPlayer. There’s no point in creating yet another chroot if we’re already in one. You have typo in first command – we need to install package ia32-libs instead of ia32-lib.